I finally subscribed to the Electric Quilt blog in my feed reader. By the Way: I used to use Google Reader for my main feed reader, which is adequate, but when I changed over to firefox from internet explorer, about a month ago, I found a firefox plug-in feed reader called feedly, which is quite nice for reading blogs that don’t seem so linear. 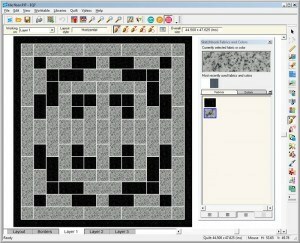 Anyway, the Electric Quilt blog had this article about someone using Electric Quilt software to design a tile pattern for their restroom. Anyway, the quilter helped her husband with the tile design, including using the sashing for the grout, downloading a picture from the big box home improvement store to import into the fabric choice. Here is a picture of her project below. Very nice and very creative. 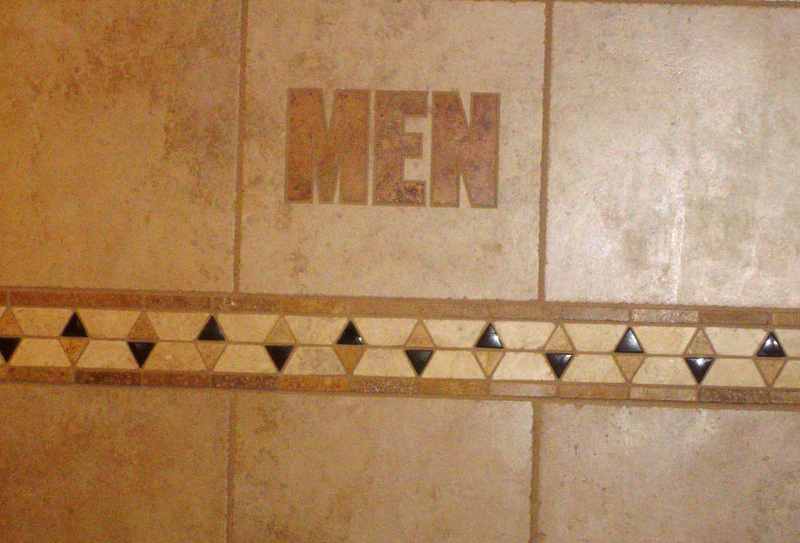 I’ve always said that quilt patterns can be found in restroom tiles. Apparently vice-versa. Now don’t think me perverted, we were standing outside a restroom IN THE HALLWAY at a truck stop, waiting in line for the women’s restroom and this was the view from the hallway. I think the tile would be a fun border for a quilt, don’t you? Love the border.. it would be a nice border! ANd wish I had thought of using software for my mosiacs.. it would have made it so much easier! I too have used Electric Quilt to design a tile pattern. I was doing a kitchen Reno this summer and couldn’t find a program that would help me design the backsplash….so turned to EQ. My tile layer was very impressed and said it saved her a ton of work. I was able to use the design to choose a size of tile that exactly fit the space with minimal cutting…saved a bundle by doing this.